In the previous post we received a stream of data from the Arduino and displayed it inside a Visual Basic text box. This is all well and good but we did not know what the data was, we simply received it and displayed it. The next step is to send data that has some kind of meaning and display it in an appropriate field. This could be a temperature, a wind speed, a switch state or anything else. In the following example I am using a 1 wire temperature probe (it’s actually got 2 wires…), a potentiometer and a button switch. So we know when we have a complete data segment or code we will use start and end markers, “<” and “>”. The Visual Basic app will ignore anything not inside the markers. The potentiometer gives a value between 0 and 1023. To make things a little easier the example uses ascii characters for the value (“1000″ instead of 1000) and a fixed length of 4 characters; “0000” to “1023”. Of course this means the value has to be converted to a string before sending. – The temperature probe is connected to A0. – The potentiometer is on A1. 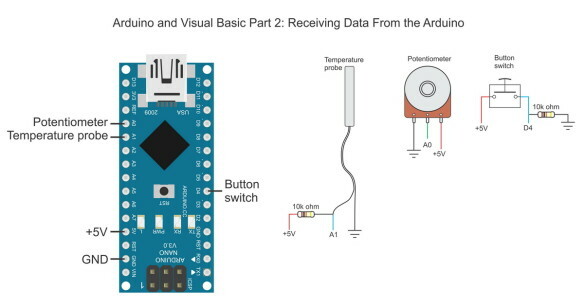 The Arduino sketch polls the values of the pins and then, if the value has changed, creates the code and then sends the code out over the serial connection. * Read pin state / value and send to a host computer over a serial connection. * This is a one way communication; Arduino to a host computer. No data is received from the computer. //The pot I am using jitters +/-1 so I only using changes of 2 or more. // digits = the number of digits to use. Now that the Arduino side is working the Visual Basic app is next. We can use the Visual Basic app from Arduino and Visual Basic Part 1: Receiving Data From the Arduino as the starting point but we need to make some changes. Unlike the previous example, the data is now inside start and end markers and we we need to determine what data we are receiving. 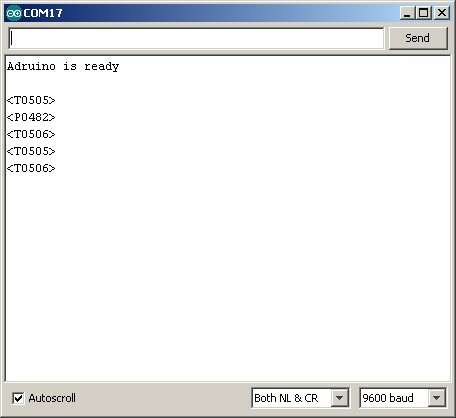 It waits for the user to select a COM port and click the connect button. It then makes a connection the Arduino. Here is a screen shot of the Visual Basic App in action. The form is the same one used in the previous example. 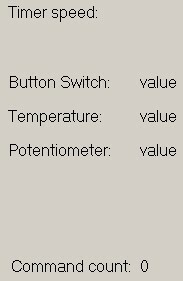 New labels have been added to show the temperature, the potentiometer value and the switch state. I have also included labels to show the timer interval and the number of commands processed. I have left the text box and use it to display the current command. You can also use the text box for debugging. Dim receivedData As String = ""
SerialPort1.Encoding = System.Text.Encoding.Default 'very important! on start up, the Form1_Load function is called. 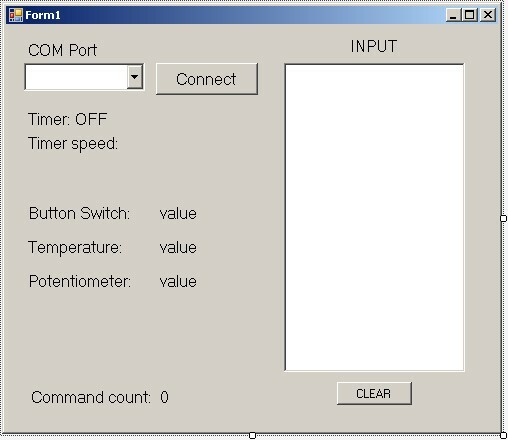 This updates the timer interval label, and populates the combobox with the available COM ports. 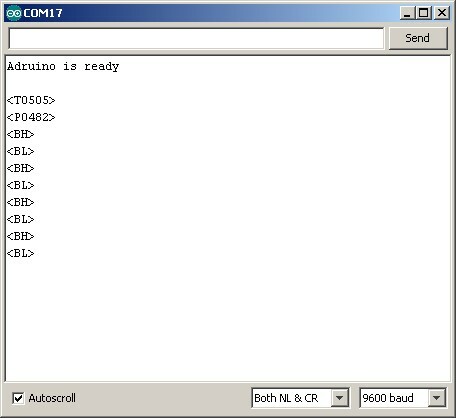 The program then waits for the user to select a COM port and hit the Connect button. If the Connect button is clicked without a COM port selected an error message is displayed. 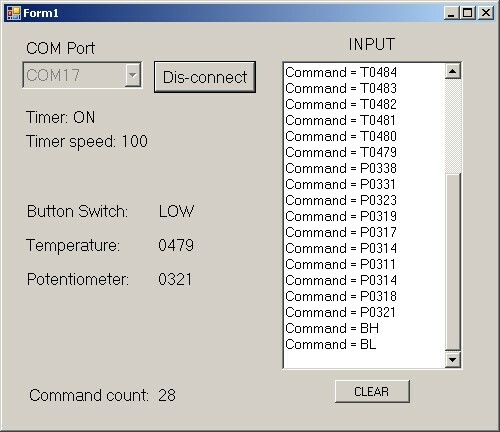 If a COM port has been selected then the serial port attributes are set and the program tries to open the port. If successful the Connect button text is change to “Dis-connect” and the timer started. The timer is used to check for incoming data. The timer is set to 100ms. This means there are 10 checks a second to see if there is any new serial data. 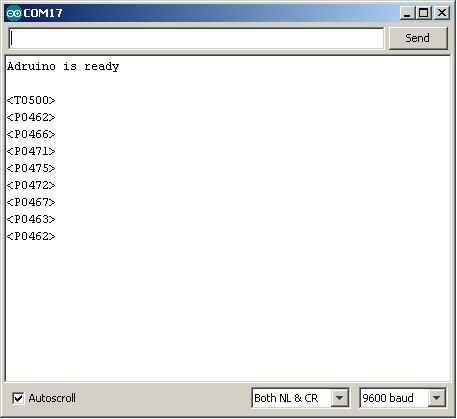 If there is an existing connection (the Connect button text is not equal to “Connect”) then the serial port is closed. When the timer function is called, any new serial data is added to a buffer in the form of a global variable called receivedData. Adding the new data to a buffer like this ensures we get full commands. Only checking the latest received data means we are likely to miss commands. The received data could be fragmented like this; “34<“, “T011″, “1><BH><P0245><BL><T01″. If the buffer contains a start marker (“<“) and also an end marker(“>”) then we have a complete command (not 100% true!) and the function parseData() is called. Because receivedData is a global variable we do not need to pass it to the parseData() function. All the heavy work is done in the parseData() function. Because the received data buffer may have more than one command the function loops through the received data removing the first complete command from the buffer on each loop. The positions of the start and end markers are used to determine if we still have a complete command. Using the positions of the first start and end markers the first command can be copied to the variable newCommand. Once we have the command we can check which one it is and update the form. 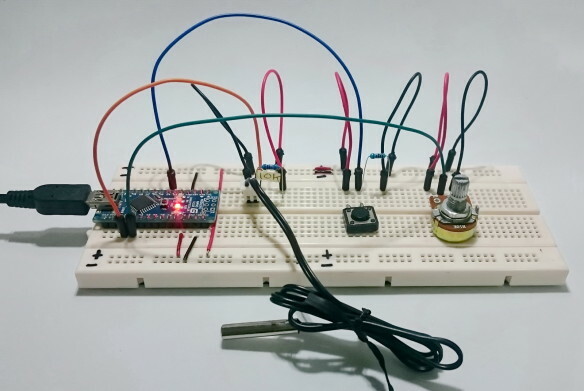 This entry was posted in Arduino + Visual Basic by Martyn. Bookmark the permalink. I ran the program and sometimes it works good and sometimes it gets stuck. The VB says (after it compiles the program) that there might be a null exeption when running the program since the parse() function may not return a value for all cases. Is there a cure for that? I haven’t used this for a while but I never had an issue in the past and I use the same code on my dropController project which runs without a problem. The parseData() does not return a value. It looks for the start and end markers and then takes the data they contain. If it finds data it checks what the data is. Can you post a more specific error and possible show the program line in the code. By the way it is very good example and very well comment, it helps a lot !!!! Well done!!! I have a problem and was wondering if you could guide what the issue could be? I setup a board with 2 switches, Switch A and Switch B. Switch A = Pin D2 and Switch B = Pin D4. Used the same code of yours in the vb software to monitor both pins. In the arduino, I programmed them as AH, AL (for Switch A) and BH, BL (for Switch B). Attached 10K ohm resistor against Switch A as per your diagram and again one more 10K ohm resistor against Switch B in the same manner and polarity. Power Source: USB from the laptop (no external power). Both the pin outputs keep swapping between H and L after every few seconds (ranges between 3 seconds to 15 seconds but averages at about 6-8 seconds). Could there be an issue with the circuitry? By turning on/off the switch – i am still not able to make out if its affecting the signals as the output keeps swapping between H and L for both pins every few seconds. Could you guide what could be the issue? Here is a sample output with timestamp. You can notice the difference in seconds. This keeps repeating for ever. My first thought is an issue with the switches or lose connections. Are you moving the circuit while using it? Try different switches if you can. If not, remove the switches and replace with a short length of wire and then use the wire as a switch. Also try just using the serial monitor. Thanks for your guidance. Yes, I verified everything that you said. The circuit is not moving, its static on a table. Infact, I dont have switches at the moment as I am still prototyping. I am using two short wires instead as a switch. Upon further research, I found many people are having similar issues. I even measured the voltage across the pins in a H and L state and they were reporting 0.45-0.50 volts – which is almost an OFF state. 1) Circuit is incorrect. I will start from scratch again. This is because voltage drop across the PINs are 0.45v during H and L – indicates an incorrect circuit setup. 2) The OFF and ON swaps are explained due to tri-state of the PINs. I read a lot about everyone having this issue. One link here: https://forum.arduino.cc/index.php?topic=183977.0 and many of them are suggesting different methods to rule out the tri-state of the PINS. I will address both issues above if possible and post the outcome soon. Thanks a lot for your guidance though and it was helpful to start looking in the right direction towards trouble shooting the issue. Also, Yes, Output in Serial Monitor was also behaving the same way as explained yesterday. Thanks so much. I will keep you posted on how this goes. Here’s the link http://arduino.stackexchange.com/questions/12951/testing-tri-state-pin-erroneous-results-with-internal-pullup/12955#12955 that explains the behaviour I was having. Unfortunately, I am not very good at designing circuits, so I cannot interpret how to come up with the schematics for this suggestion, so i will have to consult someone or maybe you could help with a diagram if time allows you. If not, its ok, i will manage somehow. Isn’t this the exact behavior i reported initially? pretty much so. Thanks once again. Will post further updates. I would expect this behaviour if the pin was floating, do you have the it set for input? What is the voltage from the VCC rail? The opposite side of the switch. This is marked +5V on the switch in the diagram above. You also try switching the polarity of the switch. Make the resistor pullup and then connect the switch to GND. This swaps how the switch works. HIGH is not pressed, GND is pressed. Yes, both were set to INPUT. Am bad at understanding electronic language technically but I sort of get the idea of what you are suggesting. Also, I even tried adding >1M Ohm resistor and using that PULLUP PIN idea from the other post – even that didn’t work. Going by your suggestion to use PULLUP, I found a way to make it work. Not sure if this is good enough for a production environment but the outcome is perfectly as expected. I removed all the resistors and converted both the pins from INPUT to INPUT_PULLUP. Then, directly connected pins to switch (aka the 2 wires as I do not have physical switches) and from switch to ground thereby using the internal pullups of the nano. It worked perfectly after that. Only had to reverse the logic like you suggested that it would return HIGH when not pressed and GND when pressed. This was my new schematic setup here https://www.arduino.cc/en/Tutorial/InputPullupSerial and I setup 2 switches instead of one with the changes explained above and now it works perfectly. Thank you so much for your suggestions and directions. I would still be interested to resolve the issue with your suggestion though. I am still not convinced why it didn’t work with the external resistors and I will update you when i get to work on it. But for now – it worked perfect after using both pins as pullups. Don’t use “” use something with an actual value like “Lamp: Off”. On the Arduino, keep the switch state in a variable and only send “Lamp: Off” when the state changes to off. I suspect the value of receivedData is not just 1H. Are there additional characters, possibly non print characters? Check the length of receivedData. I am working on a project similar to the one described here. Also, I have read Part 1 of this post. I want a connection of 4 to 5 push buttons (e.g A,B,C,D), a RFID reader and a few RFID tags. For example when button ‘A’ is pressed, I want to record ‘A’ into a tag that is placed before the reader. Besides, I want to keep count of how many times each button has be pressed and send this information to my VB.Net application. I am a final year student of computer science with no electronic background. My project is a little more complex but this aspect is a major hurdle for me to overcome. Everyone, please help me on this. I would also want to know what electronic components are needed to accomplish this task. If you feel the information is not sufficient, please let me know. Thank you very much. I think there is a little bug in the software. At that point their values are the same so it doesn’t really matter. i wanna ask about, how we read the digitalwrite in arduino and then send to VB10, which in VB10, when we got the data that change the backcolor of a shape. make a code of traffic light and in VB just monitoring.